UTICA, NY – A trip to Ireland for two, for only $20? Hey, it could happen! The Great American Irish Festival is pleased to bring back the very popular “Ireland Trip” raffle. That’s right, a one-week trip to the Emerald Isle – including airfare from Albany, hotels and coach transportation – could be yours, for a mere investment of $20. The raffle, which will benefit the Great American Irish Festival and the Irish Cultural Center of the Mohawk Valley, promises a week of sightseeing, shopping and guided tours, covering the length and breadth of the island. Conveyance and tours will be facilitated by Go Ahead Tours. 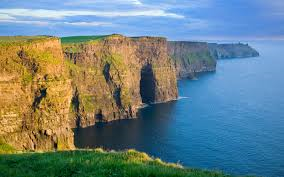 In this 7-day/6-night trip, you’ll experience the sights and sounds of Galway, the splendor of County Cork’s awe-inspiring Cliffs of Moher and the Burren, the quaint town of Cobh, Blarney Castle, and places, old and new, in the beautiful city of Dublin. The trip is scheduled for October, but there may be flexibility based on availability. Only 1000 tickets will be sold for this golden opportunity to experience the landscape, history and culture of one of the most beautiful places on the planet. Tickets can be purchased by contacting Sheila Knapp at knappsl@twc.com. The drawing will be held at the Great American Irish Festival, at 10 PM on July 27th, 2019. The Great American Irish Festival is a 501(c)(3) non-profit charitable organization.